After an accident, a young man named Kazemichi is given many prosthetic parts and told that he has been given a second chance at life. However, he is also told that his artificial heart has the possibility of giving out at any time. Kazemichi spends his days detached from the world until he meets a woman named Juri, and starts to once again regain feeling inside. Thus starts his search for the truths in his life - both the present and the past - as the end of his future draws startlingly near. 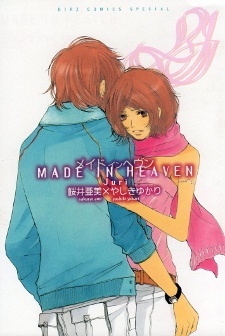 Made in Heaven was publlished in English by Tokyopop on March 7 and May 9, 2006, respectively. I was looking for something to read on my Sunday afternoon and this had been on my to read list for a while. The story is split into two chapters. The first one being the main guys story Kazemichi and the second from the girls Juri, but this isn't the same story told twice from different points of view, its something a little different. For a rare thing the synopsis on myanime tells a good summary of the story and expanding on it from my behalf would be a spoiler. The first chapter is wonderful narrated by Kazemichi. I felt his life; i felt his disconnection, without angst, from society. Most of the people around him are broken and being mostly prosthetic he lived but questioned why, living almost emotionless, until he meets Juri and for once in his life he is drawn to someone. One line i love was " Even more... I wanted to see her face asleep on my shoulder... after i made love to her." Juri's story is that of trying to figure out who Kazemichi is and was before the accident. Juri is expressionless but kind, she takes what comes her story is mature and realistic, existent. The art style is modern, thin, long legs, clean lines. Everything is very well drawn from hair to clothing. Most, if not all the characters are good looking, even the ones who are the not so nice people. This was one of those stories that put me in a mood, not a sad mood or a happy mood, but i knew i had just read something beautiful.